Lots Road is that rarest of street configurations, an L-shape so it has a north side, a south side an east side and a west side. So where do we begin? Here? This is the view looking south from Stanley Bridge, just to the west of the junction with the King’s Road and right on the border of Kensington and Chelsea. 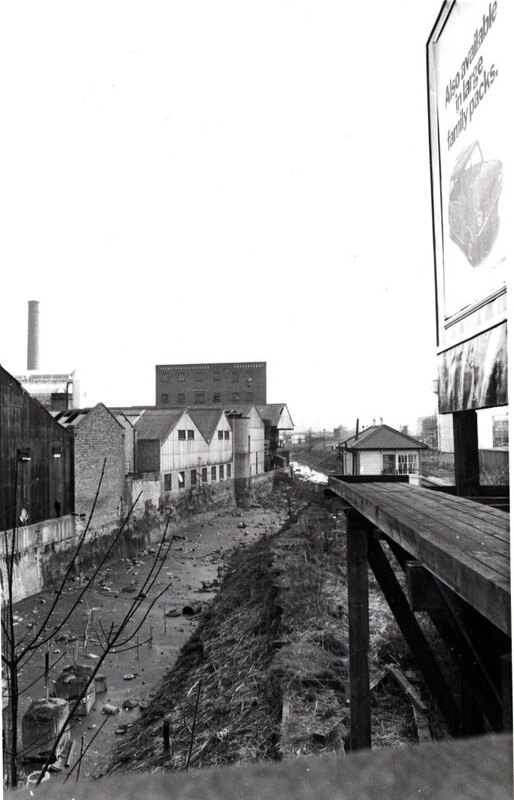 The rail line which was constructed on top of the filled in section of the Kensington Canal is on the right but it looks as though a small section of this part of the creek survived. But let’s not go that way. What about starting at the other end? 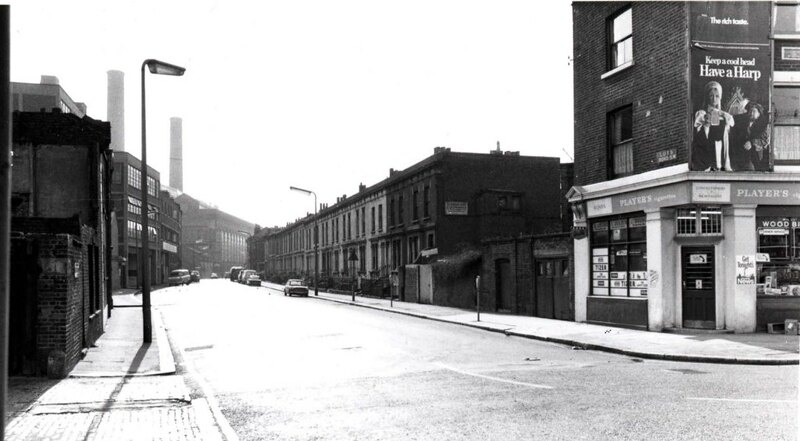 That’s the junction with Cremorne Road. The Power Station is visible with two of its chimneys intact. On the right, a small corner shop. There were still plenty of those left in 1972, the year John Rogers took these pictures for the Library. Another summer day at the tail end of the long 60s. Just as in Hurstway Street a few years before Tizer is still popular. Above the door is a lager advert featuring Henry VIII and one of his wives, uneasily drinking a pint of Harp under the motto Keep a cool head. I must have drunk Harp, one of those generic British lagers but I can’t remember the taste, if any. The north side of the street was destined to survive in the face of redevelopment but came perilously close to meeting the fate of Bifron Street, Raasay Street and the rest. A little way down the road you can see one of the towers of the World’s End Estate rising. In 1972 it would become the largest council estate in Europe. It’s often assumed now that the large housing developments of this period were a bad thing. 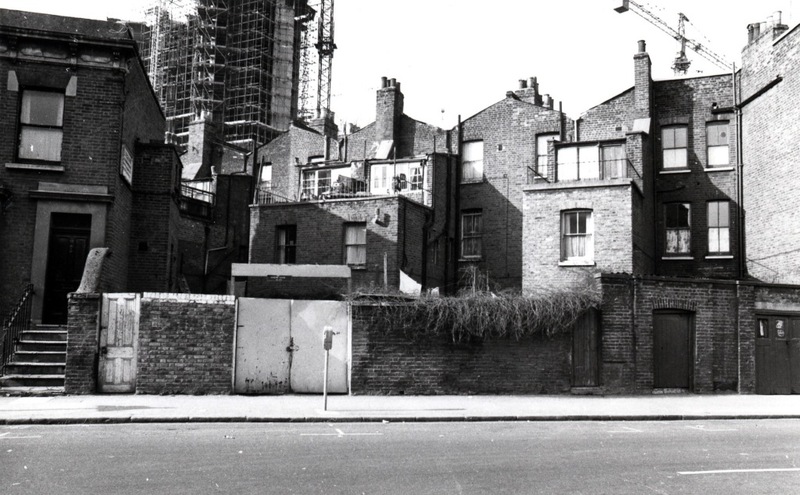 It’s certainly true that the houses in the World’s End which were demolished at this time would probably have been gentrified had they survived and would now look pretty good. But almost none of them would be in use as social housing. I’ll do a post on the construction of the estate one of these days. The south side of the street was occupied largely by commercial buildings of one kind or another. 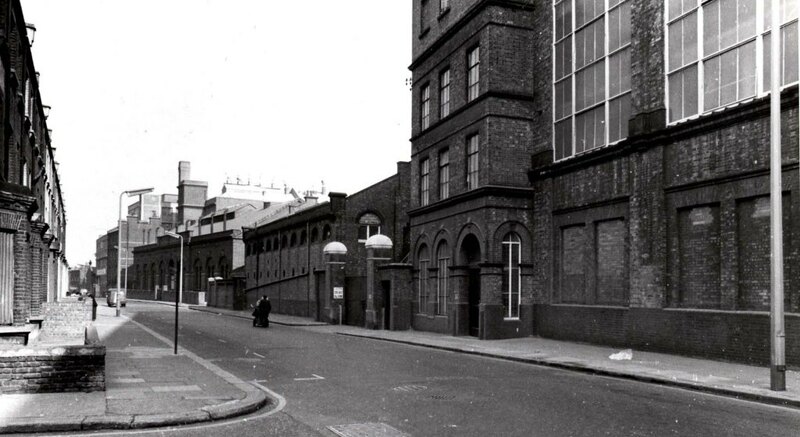 The easternmost part of Chelsea had been an industrial zone since the latter half of the nineteenth century. 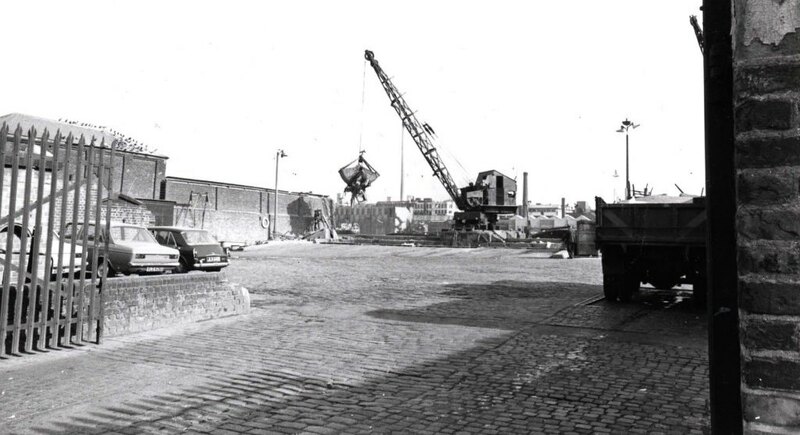 Even when the high and the low were at play in Cremorne Gardens, raw materials were being landed and unloaded at the various wharves on the river and on Chelsea Creek which continued north as the Kensington Canal, a never quite profitable venture created by the then Lord Kensington. Lots Road the former Poole’s Lane followed the line of the canal northwards to the King’s Road hence the L shape. 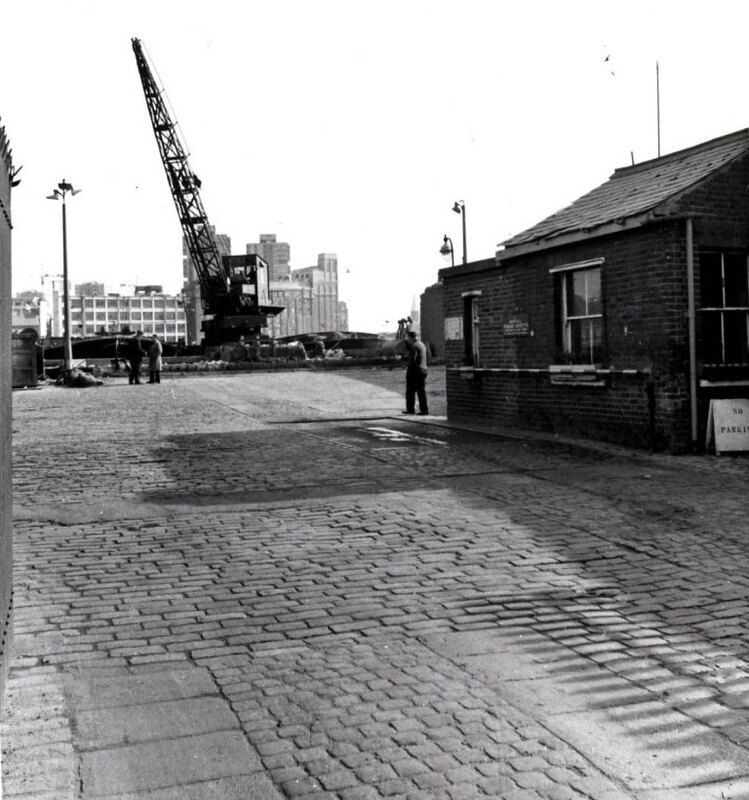 The wharves were still in use in 1972. Note the cobbled surface redolent of the 19th century even clearer in the picture below. 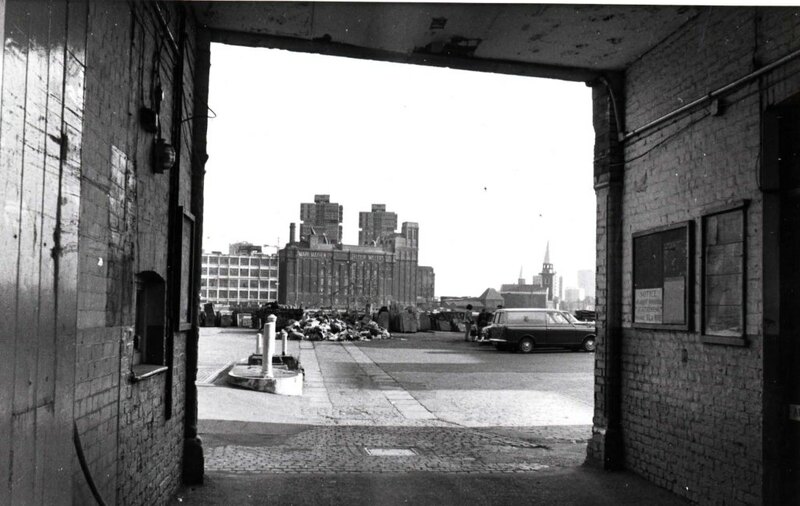 This shows the warehouse across the river in better detail but as you can also see there are two churches visible so it’s possible the one in the previous picture was not St Mary’s. Comments are welcome on this point and any other details in the pictures. For me what makes this picture fascinating is the two pigeons strolling into view from the right. It may have been a quiet moment of the day but in many of the pictures from this period you see a quieter version of London where lazy birds can walk in the street without being disturbed. A man can also wheel a barrow down the street. The large windows in the foreground belong to the Power Station. Unlike its more famous counterpart in Battersea, Lots road Power Station is right on the street where you could walk by and glimpse the massive machinery within. Further west we reach the end of the east to west section of the road. Another view of the ranks of tall windows. It does look as though we will have to pause here with a view of one of the famous pubs of Chelsea. The Balloon has gone under a few names including one very long version when it was part of the Firkin chain of real ale pubs. How did that name go? Oh yes, “The Ferret and Firkin in the balloon up the creek”, which had definite local connotations. If I do manage to walk down Lots road before next week I’ll take some pictures, but if anyone has any modern ones of their own they’d like to share feel free to send them to me at dave.walker@rbkc.gov.uk or post them in the comments section. This entry was posted on Thursday, July 11th, 2013 at 12:06 am	and tagged with Chelsea, John Rogers, Lots Road, Lots Road Power Station and posted in 20th Century, Chelsea. You can follow any responses to this entry through the RSS 2.0 feed. Love this, although your pheasantry one was my favourite – partly because I remembered it from long ago days living in Carlyle Square back in the madcap Sixties. Some fine photos of the westernmost end of Chelsea here, Dave, I especially like the one of The Balloon. 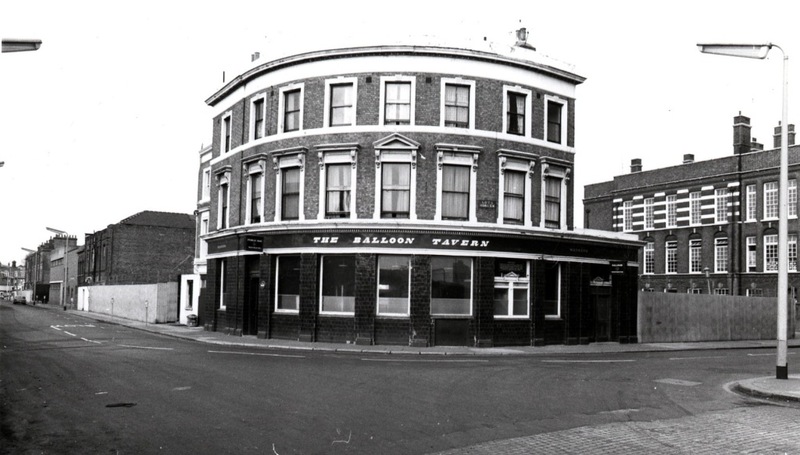 Being a youngster of 54, I only remember it as the Ferret & Firkin in the Balloon up the Creek, as you say, in the later 70s. Welcome back to SW10! Mr Walker the Mind Reader. I will try to post the forty years on photographs that I took last year. with kind ones.What a great post David. Nice to hear from you again. I was in Lots Road on Monday this week, and I’ll be including some of my pictures in this week’s post for comparison but I was taking them randomly without the guidance of the 1972 pictures so I’d love to see your pictures. Thanks for your heartening story. 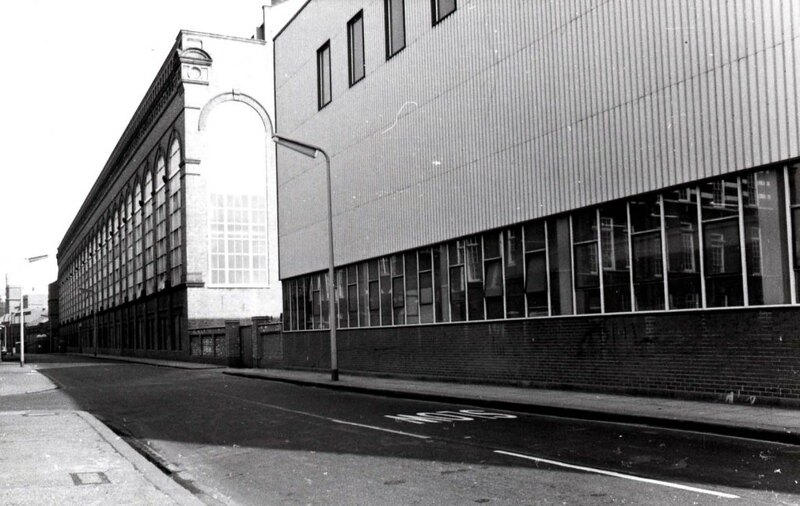 I imagine Lots Road in 1962 was a fairly grim looking place. I’ll be quoting you in this week’s post and showing some pictures of that section of the road in 1972 and Monday this week. If you haven’t been back since you’ll be surprised at the changes. Just found this. If you watch a little known spy thriller called The Deadly Affair (1966) James Mason and Harry Andrews go to interrogate Roy Kinnear at this pub. I absolutely love looking at your pictures of chelsea!! They are truly amazing. I was born in 1988 on the worlds end estate and it would be amazing to see more photos of the contruction of this place!! St Mary’s Church was built by Sir Christopher Wren. When I lived in Luna Street as a child, I sometimes dared to go to that corner shop. The whole area was dark, dingy with lots of grubby working(-class) men. I was much too scared to go down into Lot’s Road, which I believed inhabited by dangerous criminals. 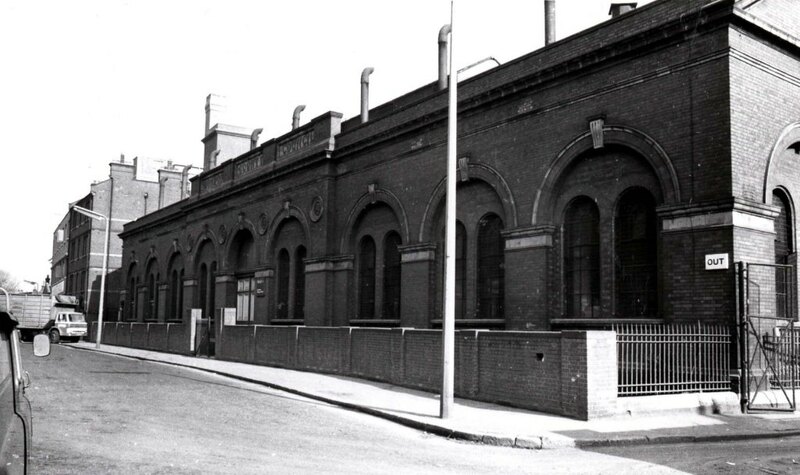 Decades later, I visited the new gym complex further down Lot’s Road, and happened on a balcony with a view of the Thames near the Lot’s Road power station. There were at least forty herons in the mud and water near the power station outfall, fishing (I would guess) for eels. Thanks for your recollections. The water near the power station was consistently warmer than the river in general because of run-off from the station. A colony of carp thrived there until the station was closed. Humans fished there for the carp. Maybe the herons enjoyed them too, along with the eels. 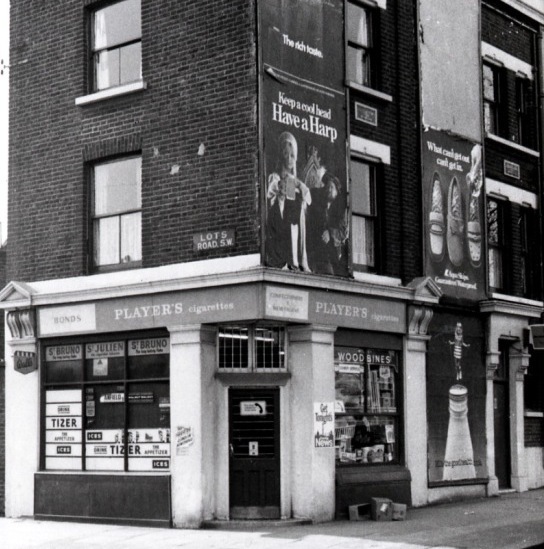 The comment above by James about ‘The Deadly Affair’ (1966): there are some good shots of the pub and the house adjoining it, looking very much like it did in the 1972 photograph. Is it the pub interior in the film? And is the garage in the film nearby? Or, I guess, was it? because guessing it’s not there any more. PS. I spoke to soon. 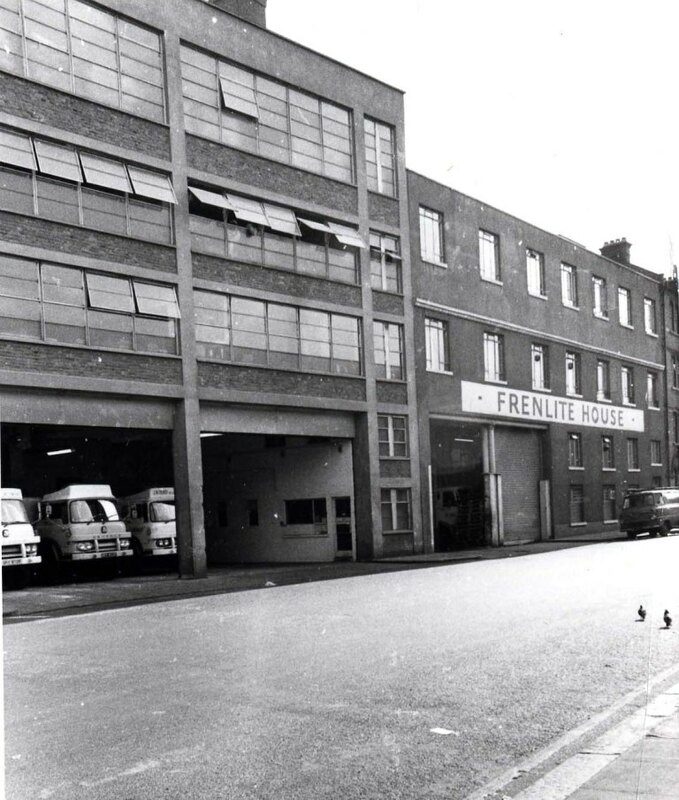 The ‘garage’ premises clearly were in the same street on the opposite side of the road but further from the junction. MY cildhood was lived out in number 39 Uverdale Road top floor flat. Left there never to return in 1956 when my mum died. Many happy memories of hours spend huddled together with our girl friends on the bag wash door step. We were the only black family to live in meek st in the fifties it had a great community then . I lived for a while with a girl in the flat above Fens, the furniture shop on the corner with Ahsburnham Road, now a high end rug shop. Harp lager is Irish btw, a Guinness brew, but from Park Royal so perhaps British after all!